Within a few short years, writer-director-producer-actor Tyler Perry emerged not only as one of the most recognizable names in entertainment, but as a media brand unto himself. Beginning with his first theatrical production, 1999′s “I Know I’ve Been Changed,” Perry connected with an under-represented, yet fiercely loyal fan base as he presented shows on the urban theater circuit. Adapting his plays into modestly budgeted feature films, he introduced America to boisterous matriarch Madea, a one-woman Greek chorus, in highly-profitable offerings like “Diary of a Mad Black Woman” (2005) and “Madea’s Family Reunion” (2006). Perry found an equally receptive audience on television with the broad sitcom, “House of Payne” (syndicated, 2006; TBS, 2007- ) and its subsequent spin-off series. Astonishingly prolific, he churned out several non-Madea films, as well, including “Why Did I Get Married?” (2007) and “The Family That Preys” (2008). Together with his friend and inspiration, Oprah Winfrey, Perry went on to produce the heart-wrenching drama, “Precious” (2009). By the following decade, he had grown in stature to the degree that he was deemed fit to fill the great Morgan Freeman’s shoes when he took on the role of the eponymous fictional detective in the thriller, “Alex Cross” (2012). Decried as heavy-handed morality plays populated with stereotypical caricatures by most critics and many in the African-American entertainment community, there was no denying that Perry’s offerings struck a chord with a broad cross-section of audiences who saw their own families in his raucous slices of life. Born Emmitt Perry Jr. on Sept. 19, 1969, Perry grew up in a New Orleans purgatory located two blocks from expensive mansions and two blocks from extreme poverty. His working class father expected Perry to join him in the construction field, but the artistically inclined kid who suffered from depression and a teen suicide attempt (resulting from childhood abuse) did not seem like a likely candidate. He was working at an office job in 1991 when he happened to catch an episode of “The Oprah Winfrey Show” (syndicated, 1986-2011), that talked about the healing powers of writing. Perry picked up a pen and began chronicling his painful past, fictionalizing the names in case his family or friends happened upon it. He adapted his dramatic journal into a play called “I Know I’ve Been Changed,” which addressed the issue of domestic abuse. Eager to see the play come to life, Perry took his life savings, $12,000, and moved to Atlanta, GA. He rented a theater, and staged “I Know I’ve Been Changed” in 1992. The first offering of the unknown playwright failed to attract audiences and was a heartbreaking financial failure. Perry stayed on in Atlanta and took on a series of odd jobs including working at a restaurant and selling used cars. Hard times hit in 1997 with Perry having to live in his car, but the following year things turned around with an offer to stage “I Know I’ve Been Changed” a second time at Atlanta’s House of Blues. Perry was wiser about the business this time around, and by heavily promoting the show in advance at area black churches, he managed to bring in huge crowds and sell out his first run of performances. In just two weeks, the play was moved to the city’s famed Fox Theater and continued to sell out, eventually drawing the attention of investors who found ways to market the show more heavily. The show hit the road and Perry built a following on the gospel theater circuit, selling out in Dallas, New York, Chicago, and Philadelphia. After catching one of the shows, Dallas minister and author T.D. Jakes approached Perry to adapt his best-selling book, Woman Thou Art Loosed into a stage musical. The Perry-penned production began touring in 1999 and was also an immediate hit, grossing $5 million in just five months. “I Can Do Bad All by Myself,” a comedic drama about a woman leaving her cheating husband, moving in with her grandmother, and learning to move on with her life, premiered in 2000. That successful play marked the introduction of Perry’s famed character Mable “Madea” Simmons, who would become a regular supporting character in many of his works. Part Greek chorus and part voice of reason, elderly Madea (always portrayed by Perry in drag) also served as a pratfalling, malapropism-prone source of comic relief. Madea proved to be an important element in Perry’s comedy formula – a female who could get away with voicing opinions a man would not dare, and offering perspectives that would leave younger characters accused of political incorrectness. A Gospel musical adaptation of minister Jakes’ “Behind Closed Doors” premiered in Atlanta in 2000, with Perry serving as playwright, producer, and director. The production was recognized with four NAACP theater awards. The following year, Perry was nominated for a Helen Hayes Award for Outstanding Lead Actor while touring with “Diary of a Mad Black Woman,” another family drama about a wealthy businessman who leaves his wife for her best friend. Perry did double duty as the erring husband and Madea in this successful run. Exactly one year later, Perry gave Madea center stage in the touring production “Madea’s Family Reunion” and kept delivering his uplifting stories to his loyal fan base with “Madea’s Class Reunion: The Class That Had No Class” in 2003. Madea was absent in Perry’s 2004 production “Meet the Browns,” about a death that shakes up family ties, and “Why Did I Get Married?” a shift towards more sophisticated drama that featured couples on a weekend getaway addressing longstanding issues of their relationships. With his proven track record of attracting huge numbers of African-American audiences to his established brand of entertainment, Perry was ready to take his message to the next level. He began with a film adaptation of “Diary of a Mad Black Woman” (2005), meeting with executives at Paramount Pictures and Fox Searchlight, both of whom were lukewarm about the project. When Searchlight insisted that an experienced screenwriter be brought in to polish his script, Perry turned to Lions Gate Films, who allowed him creative control on the micro-budget film, which was produced for just $5 million dollars. Any studio that had doubts about whether there was an audience for non hip-hop culture African-American films got their answer when “Diary” hit number one at the box office and went on to earn a total of $50 million dollars. The film was lambasted by critics – accused of perpetuating negative black stereotypes by some – but this was no hindrance to Perry, whose successful stage career had thrived outside of mainstream theater, virtually ignored by Broadway but embraced by audiences who enjoyed the rare opportunity to see their own experiences reflected onstage. The prolific playwright-turned-film producer sent his next stage production, “What Happens in the Dark,” on tour without him in 2006 and turned out an adaptation of “Madea’s Family Reunion” (2006) that earned him a flurry of nominations from the Black Reel Awards, Black Movie Awards, and the Image Awards. His first humor book, Don’t Make a Black Woman Take Off Her Earrings: Madea’s Uninhibited Commentaries on Love and Life hit the bestseller list in 2006, and the following year, he unveiled a weekly Internet-only talk show in addition to writing, directing, and producing “Daddy’s Little Girls” (2007). The significantly more serious story of a mechanic (Idris Elba) seeking custody of his three daughters from his unfit wife failed to connect with critics, making only half the box office of its predecessor, but its reception was enough for Perry to keep his production deal and begin thinking beyond the big screen. He developed an original sitcom called “House of Payne” (syndicated, 2006; TBS, 2007- ) about a multi-generational family living together under one roof. In an almost unheard-of deal, cable network TBS ordered 100 episodes based on a limited pilot airing, and moved the show into prime time rotation in June of 2007. USA Today promptly hailed it as among the worst sitcoms of the modern era. In the fall of that year, Perry rolled out an adaptation of “Why Did I Get Married?” starring himself, Janet Jackson and Jill Scott. Mainstream critics were averse to the heavy-handed moralizing of the tale of married couples in crisis, but the film’s portrayal of the wealthy, professional African-American lifestyle was a spot-on winner with its target audience and earned a Best Picture nomination from the Image Awards. Perry followed up with an adaptation of “Meet the Browns” (2008), starring Angela Bassett as a struggling single mother who finds refuge from her big city problems with the family she has never known in rural Georgia. Perry’s biggest budget yet meant noticeably better production values and the ability to attract even wider audiences with better known talent. Perry made a marked effort to appeal to crossover movieg rs with “The Family that Preys” (2008), an ensemble film featuring Alfre Woodard and Kathy Bates as friends whose family dalliances challenge their loyalties. As “House of Payne” maintained steady viewership on TBS, Perry launched a second primetime offering in early 2009, a sitcom adaptation of “Meet the Browns” which focused on the elder Leroy Brown character. Perry continued to mine his past playwriting efforts for feature film material like the family comedy, “Madea Goes to Jail” (2009) and the romantic drama, “I Can Do Bad All By Myself” (2009). In a rare work that he neither wrote, directed nor starred, Perry co-produced the acclaimed drama, “Precious” (2009) with Oprah Winfrey. The disturbing film went on to garner several nominations and awards, including one for Best Picture. A lifelong fan of the sci-fi franchise, he also finagled a small cameo as the head of Starfleet Academy in J.J. Abrams’ reboot of “Star Trek” (2009). The following year, he delivered the sequel to his earlier hit, “Why Did I Get Married Too?” (2010), in addition to the drama, “For Colored Girls” (2010), based on his stage play, “For Colored Girls Who Have Considered Suicide When the Rainbow is Enuf.” By 2011, Perry’s near constant output had paid off handsomely, when Forbes magazine named him the highest paid man in entertainment, earning approximately $130 million for the year. He showed no sign of slowing down as he moved into the new decade with familiarly named films like “Madea’s Big Happy Family” (2011) and such sold-out stage productions as “The Haves and the Have Nots” and “Madea Gets a Job.” Ready to take on more prominent starring roles, he played the lead in his feel-good drama “Good Deeds” (2012) prior to starring in the crime-thriller, “Alex Cross” (2012), in the role of the psychiatrist-detective previously personified by Morgan Freeman. Do you want to hire Tyler Perry? Directly request a quote. In 48 hours we can send you the availability of Tyler Perry If you would like to book Tyler Perry, Entertainment Booking Agency is the right place. We will offer you the best price and contact the management or we directly contact Tyler Perry. For corporate appearances or speaking engagements you can contact our agents and the will help you true the process. 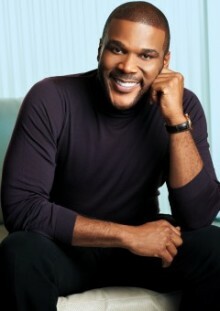 Tags: hire Tyler Perry, Tyler Perry booking, book Tyler Perry, Tyler Perry appearances, find more information on booking Tyler Perry for appearances, Tyler Perry speaking engagements, Tyler Perry endorsements/spokesperson, Tyler Perry appearance fees, Tyler Perry booking agency contact info, biography of Tyler Perry, Contact an artist booking talent agent find a speakers bureau that can book Tyler Perry, speaker booking agency for Tyler Perry, Tyler Perry booking agency, Tyler Perry booking for corporate event. EBA is one of the biggest entertainment booking agencies in the World. We book hundreds of celebrities, artist, athletes and speakers in a year. Important to know is that we are not claiming to be the management of Tyler Perry. We are not the official agent for Tyler Perry. Companies from around the globe book these artists and speakers true our company be course we have one of the biggest networks and we always have direct contact with the artist or the management. We help you to find the right celebrities for your corporate of private events. Please contact one of our agents to get free advice and we will help to get the world-famous artist on your party.